Participants at last week's First Annual Tree and Plant Diagnostic Walkabout Workshop held in Lake Hope State Park in Vinton County, OH, came across a group of striking black-and-yellow striped sawfly larvae feeding on hickory. I had never see this sawfly before and after exhausting all of my usual routes for identifying tree pests, I followed the advice commonly given to me by seeking professional help. I sent an e-mail message with attached pictures to a collection of entomologists. Ryan Davis, Arthropod Diagnostician with the Utah Plant Pest Diagnostic Lab, identified the sawfly larvae as the Chestnut Sawfly (Craesus castaneae). A noted sawfly expert also replied: "not very common. As the name implies, it feeds on chestnut. First record I've seen from hickory; maybe an alternate host because of the lack of chestnut." 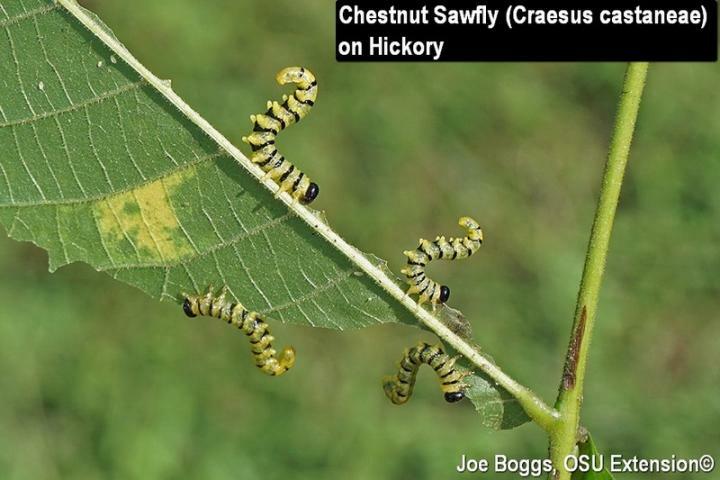 A web search will reveal that chestnut sawfly has been shown to injure newly planted chestnut seedlings. However, I could find no references indicating this sawfly feeds on other trees including hickory. During our weekly BYGL Zoom Inservice this week, we discussed how host ranges are sometimes prescribed by host taxonomy. Chestnut and hickory belong to different plant families. However, the Angiosperm Phylogeny Group (APG) system has moved the Juglandaceae family (walnut, hickory, etc.) to the Fagales order; the same order for chestnuts (family Fagaceae). The APG system relies on genetic evidence to inform taxonomic decisions. Perhaps the sawflies new about this genetic relationship all along! I would like to learn how common it is to find chestnut sawfly to feeding on hickory. Please compare these pictures to sawfly larvae you find feeding on hickory. If you find chestnut sawfly larvae, I'd appreciate receiving a picture and a location. Just click on my name at the top of this Alert to get my e-mail address.